Today in this post I will tell you how you can invite your friend on Google+ (Plus). I have given few invitations of Google+ and still giving, click here to get one. And want to invite your friend to Google+ then the easiest thing that you can do is share my Google+ invitation post with your friends and let me do rest of the hard work. 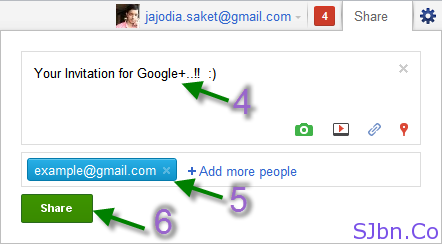 Now the respective person will get an email, in that email he needs to click on Learn more about Google+ button and then fill a form so that he can start using Google+. If you have any question or problem let me know.